Current guest arrangements, wherein the guest gets the toddler’s room and the toddler bunks with us. Eight years ago, living small was just the first step after marriage. Find an apartment, any apartment, and throw a mattress on the floor. Soon, we moved to another apartment which we started to furnish and decorate and then we threw it all to the wind to move across the country. We landed in our new space, which we had rented after seeing four pictures, and realized it was tiny. It was a basement apartment and rather haphazardly designed, but we estimated it to be just under 500 square feet. There was something novel and charming about living in such a small space, but we never intended for it to be long term. Seven years, several job changes, a baby, and a small renovation later – we’re still in the same apartment. Somewhere along the way we started considering our options. We watched the housing market in our town explode. We watched our friends struggle to purchase their first homes. We debated whether we wanted to give up our financial flexibility for savings and travel to afford a bigger space. The answer was ‘no’. Part of us always assumed we’d move to a larger home and that had to be reconciled with our new plans. 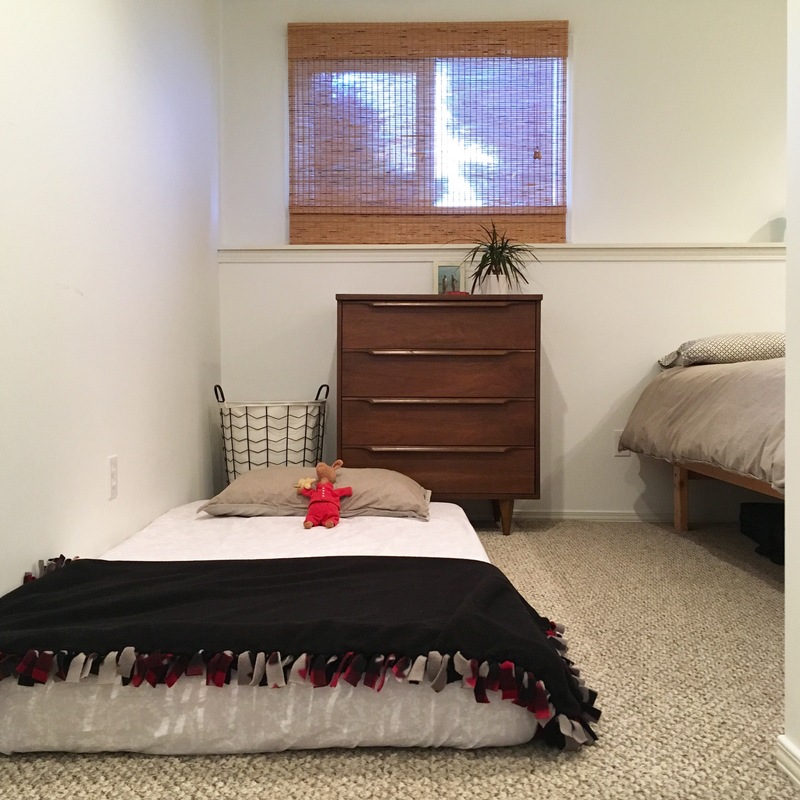 We always leaned towards minimalism, but we purged again and again until our space was comfortable and practical for our family in our current stage of life. Now, we make sure our possessions are an asset to us in the present. If something is no longer useful, we pass it on. We don’t buy or store things for a uncertain future. While we embrace the decision to live small, we do have dreams that we put on hold. Matt would love a dedicated music studio. I would love an office. Sometimes all three of us would like just a little more space to separate from each other. We love to host friends and family, but our space is limiting. For overnight guests, we have perfected the shuffling of beds and sleeping arrangements, but how convenient a guest room would be! The truth is, we will never have it all. Not in a small apartment, not in a big house. We always have to evaluate our priorities and right now that is to maintain a low cost of living so we can save and travel. The town we live in is crazy expensive, but to move away we would give up amazing relationships, all the outdoor activities we love, and careers that support our long term goals. We know we will never have it all, but for our family the things we gain from living in a small space far outweigh the sacrifices. Megan Barnum– “The Truth About Living SMALL” : What does living in a small space look like for a family of 4? Probably not a whole lot different from you. You bring up such an important perspective of never being able to have it all. In every situation there is a compromise. Bigger living space = more room but paying more in rent/mortgage utilities, etc. It’s easy to focus on only the good/attractive parts of a change. You are so wise to be looking at the full picture. Thanks so much for writing for the Small Family Homes Blogging Community, Kaylan! Just discovered your blog through the Small Family Homes collective. Really interesting stuff! I’m originally from BC (grew up in Coquitlam) but living in Hong Kong now. Sure do miss the West Coast! We were just in Coquitlam/Port Moody last weekend! I love visiting the coast. Hong Kong sounds like an amazing adventure!